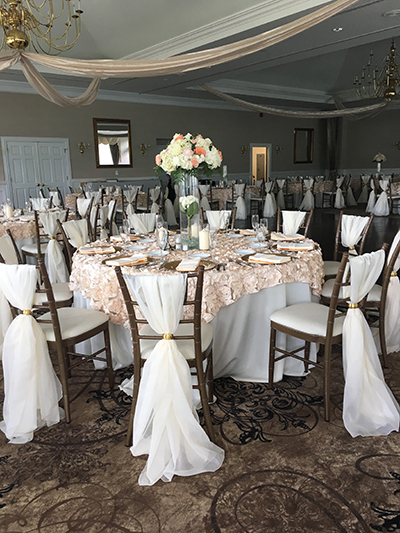 For more than a decade couples throughout Pittsburgh, PA have trusted Satin Chair Covers By Robin LLC for their wedding linen rentals. We provide a variety of tablecloths, chair covers, sashes and more for your wedding reception, and we’re pleased to work with you to make sure your every need and want is satisfied! All of our items are handmade, guaranteeing you superior quality on the biggest day of your life. 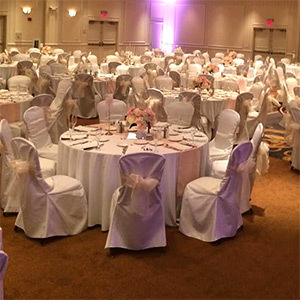 When it comes time to check chair cover rentals in Pittsburgh, PA off of your long list of wedding rental items, make sure you’re choosing Satin Chair Covers By Robin LLC! As the premier provider of handcrafted linens throughout Pittsburgh, PA and the surrounding areas, we’ve cultivated a superior reputation for service that’s matched only by our willingness to work with all couples to complete their reception’s look and feel. With volume to accommodate all wedding sizes, prices fit for most budgets and experience working at some of the area’s finest wedding venues, you can count on us for an unparalleled level of quality and customer service. We offer satin, linen and organza materials for tablecloths and chair covers, as well as other accessories that will make your wedding the talk of the town! Our fabrics come in white, ivory and gold colors, so you can select the theme that matches your event. You’re not going to find any other provider of tablecloth rentals in Pittsburgh, PA that is able to replicate the level of quality, detail and sophistication that we can! We’re a family-owned and –operated company. We provide drop-off and pick-up services directly to your venue. Our chair covers are available in many colors including white, ivory, and gold. There are no hidden installation fees! We’re pleased to serve most venues within 25-miles of Pittsburgh, PA.
"She's the best in the business!! Beautiful, thick covers with any color of sash under the rainbow. 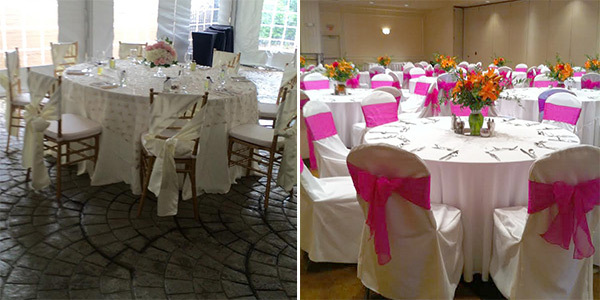 She is so personable and easy to work wit..."
"These chair covers were beautiful! They made the entire space! I can not imagine not having the ivory satin chair covers with a grey bow at ..."
"Robin is amazing!! She was super easy to work with, was so helpful to me with ideas and suggestions. During a very stressful time of plannin..."
February 14, 2017 Morgan C.
"If you are thinking about chair covers for your reception, just do it! These chair covers are absolutely beautiful and really pulled the the..."
February 14, 2017 Krystal M.
"The quality of the satin chair covers is amazing and worth every single penny. Satin Chair Covers by Robin provides amazing professional ser..."
Bring Your Reception to Life! For chair cover rentals in Pittsburgh, PA that will illuminate your reception and leave your guests breathless, consult with us today! We’re happy to provide you with a quote and any assistance you may require.